Life on board a warship has understandably changed dramatically since their first wooden inception several hundred years ago. Although the general look of a warship hasn’t changed radically in the last century, the technology that’s packed on board has increased their capabilities substantially. 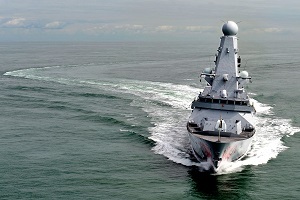 For example, the Royal Navy’s UK developed PAAMS Radar and weapon system that’s used on the Type 45 destroyer is a vast improvement to the cannonball. And although the dress uniform still worn by the Royal Navy’s personnel is designed for practicality on a wooden galleon (the blue collar was to keep tar off the uniform and bell bottoms were to aid scrubbing the decks) a ship’s company’s current day warfighting roles could not be much further from this. Personnel usually have to be monitoring many different aspects of the ship at any one time, especially when in a warfighting situation. Weapons systems, propulsion and radar pictures are just some of the things that have to be watched simultaneously, sometimes making it hard to acquire an accurate overall situational awareness. However BAE Systems, who are involved in most of the Royal Navy’s surface ship and submarine programmes, recently announced the development of an augmented reality system to address this. The set of technologies that have been unveiled are set to further increase the capability of the Senior Service’s warships – not by increasing the potency of the combat systems but by increasing the effectiveness of the ship’s company. The inclusion of augmented reality (AR) into areas of the ship such as the Bridge or the Operations Room will mean a commander won’t always have to rely on watching a console, or clarifying with other crew members to gain knowledge of what is happening. This could be of vital importance when important, safety critical, decisions have to be made quickly in a pressured environment. Wearable AR technology could also mean that commanders have more freedom to travel around the ship whilst still being ‘eyes on’ to all the relevant information needed to carry out their role. This development by BAE Systems shows how combat effectiveness can not only be increased by improved hardware, such as a more powerful radar, but can also be increased by allowing personnel to use the equipment more effectively. With a decreasing manpower throughout the UK armed forces, it’s hoped that more innovations can be made that allow for a higher combat effectiveness with the same level of crewing.